All major Autodesk products like AutoCAD, Inventor, Revit, Civil 3D, 3ds Max, Navisworks and new cloud-based tools like Fusion 360 and BIM 360 are offered in the form of complete "Industry Collections". These sets cover all or almost all parts of common design workflows in the given industry. And the price tag is just slightly above the price of a single product. 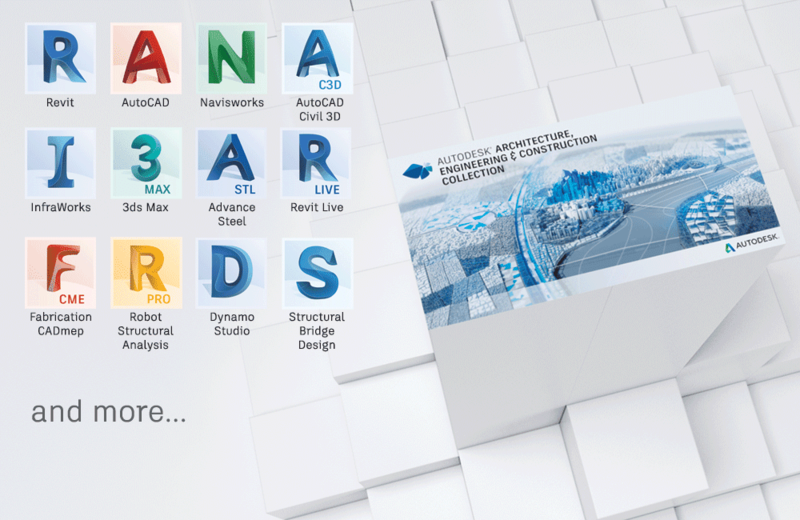 There are 3 collections: the Autodesk Product Design & Manufacturing Collection for product design, CAD/CAM/CAE; the Architecture, Engineering & Construction Collection for AEC and BIM workflows; the Media & Entertainment Collection for multimedia, film and game development. All these three Collections has been recently enhanced with new tools, without changing the price and with access to these new tools also for existing customers who has previously bought (subscribed) the Collection. Revit Live allows you to visualize your Revit models by turning them into immersive visual experiences. You can also even bring your designs into a virtual reality environment - simply with just two mouse clicks. Robot Structural Analysis Professional is an analysis and computational design software for structural analysis. Structural Bridge Design helps to design and analyse bridge structures. The visual programming tool Dynamo Studio allows to automate workflows and drive the geometry and behavior of your design models. Advance Steel and Fabrication CADmep now added to the Collection are compatible with Revit and Navisworks. Now you can conceive, model and fabricate better MEP and structural steel systems on an integrated platform. Cloud Rights - all subscribers of M&E Collection have a new benefit - the can use cloud rendring tools for 3ds Max, Maya and Arnold. Cloud rights allow to perform CPU-intensive rendering tasks in a form of batch (scripted) operations in your custom Autodesk 360 cloud space. Sketchbook for Enterprise - this sketching application can be used for illustrations, conceptual sketches, storyboards, brainstorming, etc. Arnold Subscription promo - 5-license pack of the awarded Arnold Renderer discounted by 50%; Arnold can be used locally or in the cloud.